When I attended Southern Methodist University in 1981, I was an outsider. I did everything wrong. I wore a beard, long hair, and earrings. I studied a lot and wore dirty jeans. You just didn’t do these things at a preppy school in Dallas in 1981. So I hung out a lot alone. During one night of solitude, I walked nearly two miles to the Highland Park Theater on Mockingbird Lane to watch Easy Rider. I’d never seen it before. The parking lot was teeming with bikers from all over Dallas dressed in denim and leather. Although I was not one of them, I felt more comfortable here. Together we watched Captain America and Billy drive their choppers across America. I don’t know the bikers felt about them, but I identified with the outsiders onscreen and the price they paid for not belonging. I identified the most with the quiet, introspective Captain America and his inner conflicts. After the movie, well after midnight, I returned to campus, which required walking past wealthy homes on Mockingbird Lane. I didn’t very far before a police car pulled up to me, and a cop go out. I knew what was going on. He knew I didn’t belong, and he wanted to make sure I wasn’t a threat. He asked for my ID, and I produced a student card. He looked at me incredulously, as if to say, “What the hell are you doing here?” I was wondering the same thing. He drove off and left me alone in the dark. Decades later, I still watch this movie about once a year. 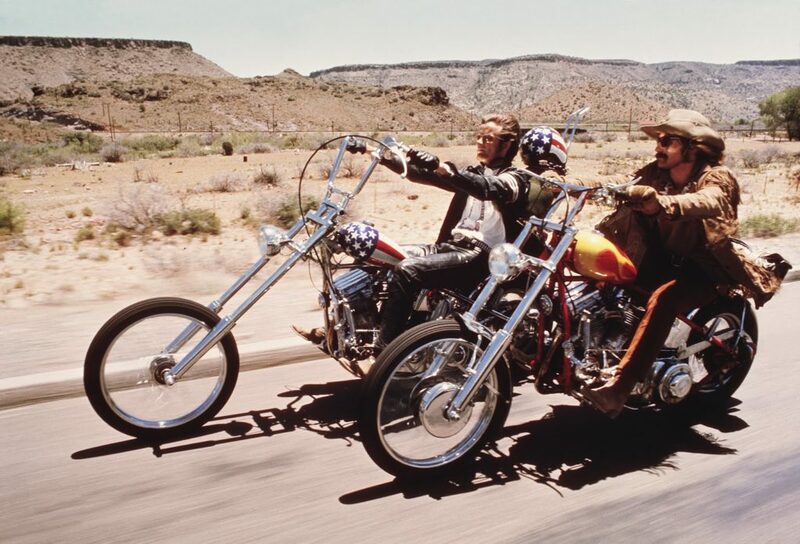 I’m sure I will when Easy Rider turns 50 in 2019. Although everything has changed for me since 1981, I still see myself in Captain America even though I don’t always know why. I don’t know the first thing about motorbikes. I stay away from drugs. I’m not into sleeping outside on the hard ground. But I understand the outsider. This entry was posted in Movies and tagged David Deal, Easy Rider, Superhype. Bookmark the permalink.